The department designated the China-based China Silver Star, its North Korean CEO Jong Song-hwa and its Russia-based sister company Volasys Silver Star as such fronts. 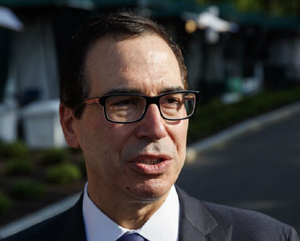 "The United States will continue to fully enforce and implement sanctions until we have achieved the final, fully verified denuclearization of North Korea," Mnuchin said. U.S. President Donald Trump and North Korean leader Kim Jong-un signed an agreement during their historic summit in Singapore in June for the North to dismantle its nuclear program. But the two sides are at an impasse over the pace of North Korea ending its nuclear and missile development programs.